Some artists or writers are content to have a pseudonym so as to disguise their work. 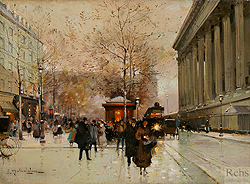 Eugène Galien Laloue was particularly adept at establishing several identities, since over the course of his career he worked under three pseudonyms: J. Lievin – after a soldier he met during the Franco-Prussian war, E. Galiany – an Italianized version of his own names, and L. Dupuy – after Dupuy Léon who lived in his same area. While these are three confirmed names that he used, there is the possibility that he used other names as well. Even his name “Galien” is questionable, since on occasion he spelled it with one “l” and on his birth certificate it is spelled “Gallien”. Why the artist went to such great lengths to perplex audiences and historians is the question that remains to be answered. 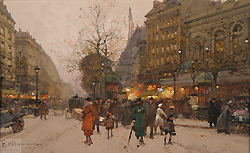 Despite preoccupation with the reclusive nature of this man, he depicted Paris and the surrounding landscape with his cool palette; in doing so he became another recorder of popular Parisian life. 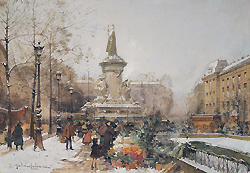 He balanced his architectural interest in Paris with several landscape views and was an equally if not more proficient draughtsman. 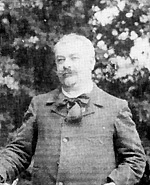 He was born on December 11, 1854 in Montmartre, the oldest of eventually nine children. His father, Charles, died when he was sixteen years old, after which point his mother, Endoxie, found him a job at the local notary. He left school to fill the position. But shortly after he felt the nationalistic urge to enlist in the military. Quitting his job and faking his name in 1871, he left for his military duty which led him through the end of the Franco-Prussian war of 1870-1871. 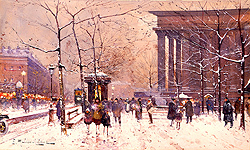 By then he had decided to become a painter. 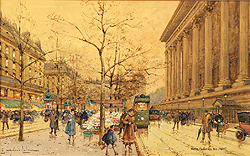 For such an eager participant in the military, to turn immediately to painting must have been a reaction against the bloody events of the Franco-Prussian war; a way to forget what he had seen. 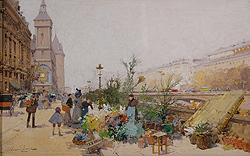 In 1874 he was employed by the French Railway lines as an illustrator, depicting the rail track that was being laid from Paris to the provinces. 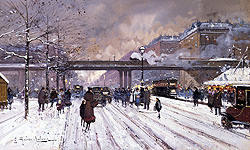 Concurrently he began painting the surrounding landscapes as well. While practical, this was unusual “training” for a young art student. His artistic training seemed to come via his other jobs. 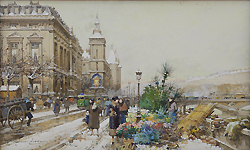 He exhibited for the first time in 1876 at the Museum of Reims, showing Le quai aux fleurs par la neige (Flower Market Along the Seine Under the Snow). 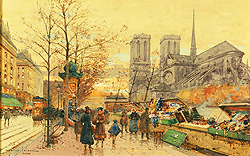 The following year he exhibited for the first time at the annual Parisian Salon, showing En Normandie (In Normandy) as well as two gouaches. 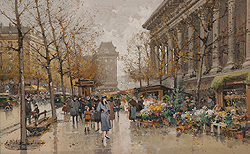 He preferred executing gouaches since they were less time consuming as his oils and brought comparable prices. At this time his teacher was listed as being M.C. 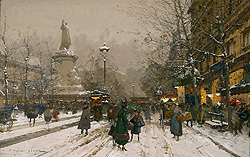 Laloue, Claude Laloue, perhaps his late father who would have taught him a more academic approach or an uncle. He was not eccentric but always conservative, practically a royalist. He was obsessed with his painting. In his private life he found simplicity alluring: he married three sisters, one after the other (beginning with the youngest and ending with the oldest). They had all lived next door to him. He lived a monastic life. All worldly pursuits, games, alcohol, the pleasure of the flesh were not for him. 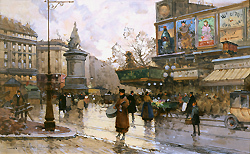 Riding his bicycle to places in Paris to paint was his only physical exercise. 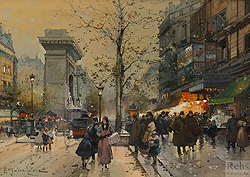 Once again we mention Mr. Eugène Galien Laloue for his lovely gouaches, as full as oils, which show most picturesquely the popular quarters of Paris. 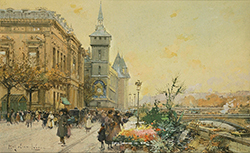 During the first two decades of the twentieth century he also exhibited at Dijon, Orléans, Versailles, Roubaix, Saint Etienne, Bordeaux, Monte Carlo, Hautecoeur, among several other cities. 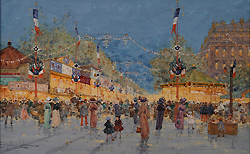 As World War I broke out, he was exempt from military service because he had volunteered for the Franco-Prussian war. He was too old to take part in the war. 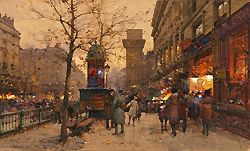 Instead, he took to his canvas and depicted scenes of soldiers in the midst of battle, paying close attention to the setting and other details such as their costumes and the action of their involvement. 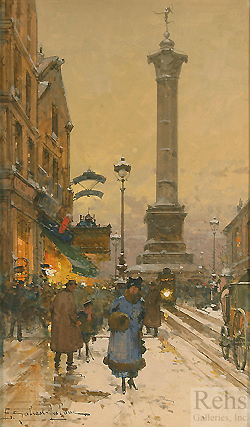 His own previous military experience must have inspired his depictions, since in his military scenes his figures are given a more prominent role than in either his Parisian scenes or his landscape paintings. He identified with these soldiers. 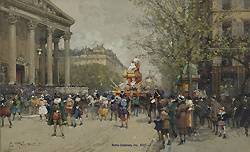 Galien Laloue continued to paint until 1940, when he broke the arm with which he held his brush. 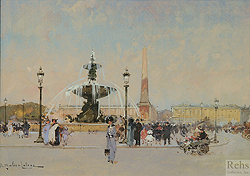 Despite his reluctance to integrate himself with others, his paintings offer a record of late nineteenth and early twentieth century Paris, focusing not so much on the relationship between its citizens, but more so on the architectural aspects of the city. 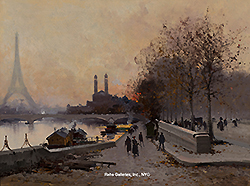 He moved out of Paris many times to depict the landscapes of Normandy and the surroundings of Barbizon, making his home for a short time in Fontainebleau. 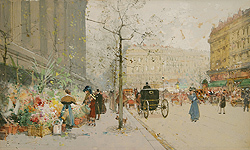 While his Parisian scenes were often of the fall and winter, he preferred to document the landscape during the brighter months of spring and summer. 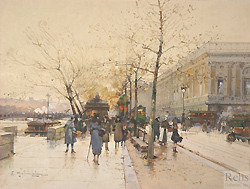 He also documented life along the canals and banks of the sea and rivers, showing an interest in maritime exploits. 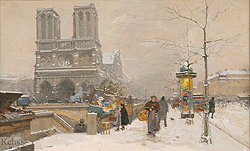 He had become very popular with both French and especially American artists and continued to paint the same scenes of Paris throughout his career. He died in his daughter’s house in Chérence, where they had taken refuge at the beginning of the Second World War, on April 18th, 1941.